October 31, 2018 - New Yorker Electronics has released the new Moxie Inductor Corporation RJ45 Connector with HDMI connectivity. The MOX-RJ45-HDMI-038 series streamlines the audio/video interface by eliminating the need for two separate ports. 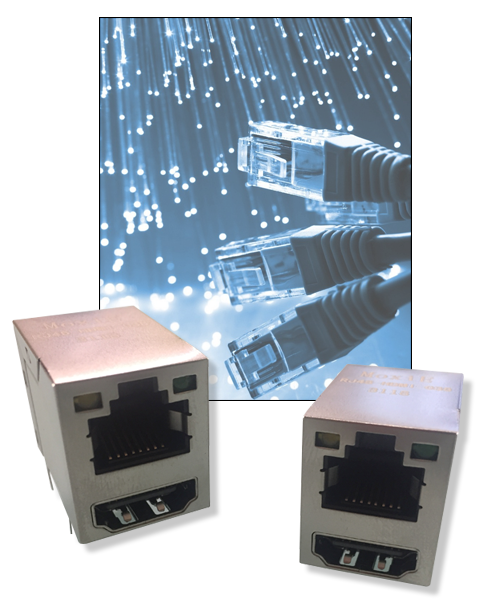 These durable connectors are ideal for display controllers, computer monitors, video projectors, digital televisions and digital audio devices. MoxiE has standard devices with yellow and green LEDs and also produces custom versions by offering quick turnaround on models with or without LEDs, custom LED colors, custom EMI tabs and custom case designs. Standard operating temperature is -40°C to +80°C however industrial temp versions are also available. These MoxiE connectors have a voltage rating of 125VAC RMS and a current rating of 1.50 AMP. They have a dielectric strength of 1000VAC RMS 50Hz or 60Hz, 1 min and retention strength of 7.7KG.G Min between the jack and the plug. MOX-RJ45-HDMI-038 is rated at a 30 Milliohms Max contact resistance and at 700 cycles per minute. Like all MoxiE products, the MoxiE HDMI RJ45 Connector Series is RoHS and REACH Compliant. Housing materials include PBT UL94V-0 synthetic thermoplastic with an insulation resistance of 500 megaohms min @500 NDC. The contact material is 0.45mm Diameter phosphor bronze gold plating over nickel with a mating/unmating force of 2.2G.F maximum.